Everyone has experienced some type of writer’s block. For some students, this occurs more frequently than others. There ar many causes of writer’s block which may include: structure, classroom environment, brainstorming of ideas, topic, class, focus, time, health, boredom, interest, and so on. This list can be endless. There are multiple ways to address writer’s block. In order to combat issues related to stress, anxiety, focus, and lack of ideas, physical movement and tactile manipulation can help calm inhibitors and stimulate the mind allowing writing to occur more freely, or naturally. Struggling students often need structure to give them stability and guide them through the writing steps they need to produce an effective writing piece. The delivery of the structure can vary from class to class (and year to year), but providing students with options and clear connections between a topic and the writing process is often critical to success. For this activity, K’NEX (http://www.knexeducation.com/) are used to help inspire creativity and to help illustrate connections in the writing process. K’NEX are building toys consisting of colorful rods and connectors. The various K’NEX building sets range from simple parts and machines to elaborate systems utilizing pulleys and levers. K’NEX are utilized in some schools to accent STEM activities, but they can also be used in a more simplified manner to help teach students the writing process. One way to utilize K’NEX is through teaching a basic writing structure. For example, a paragraph may consist of a topic sentence, a detail sentence, an explanation of the detail sentence, followed by a second detail and explanation sentence, and ending with a connecting or concluding sentence. Of course, there are many variations of this and the type of writing and age level will influence this structure. This can be stretched to an essay including an introduction paragraph, body paragraphs, and a conclusion paragraph. The elaboration of the structure varies from text to text. After an introduction to the writing structure, student groups (or teams) are given a pile of K’NEX. As a group, they create a visual representation of a paragraph, essay, or other writing text. Since K’NEX are color-coded and have the ability to connect in multiple ways, as well as bend, these visual representations can be quite powerful. As an alternative, the instructor can assign elements of a paragraph a color, so students may have to figure out how to connect pieces based on their role. Since the rods are different sizes and shapes, teachers can use this as a formative assessment to determine the understanding of paragraph/essay structure. A second way to use K’NEX with writing, is to have students use building sets in relation to an assigned topic. Students can work in teams, or individually, to construct a representation of their topic. The physical manipulation, and the creative outlet, helps students move beyond initial writer’s block allowing them to proceed with the writing process. Adding more movement to the activity could include a gallery walk or a human representation of the K’NEX creations. The hands-on activity, followed by the physical movement, provides needed mind-body connections that further enhance the academic progress with writing. I recently presented a professional development session for high school teachers. Part of the presentation required time to reflect on previous work the teachers had completed. Knowing there the participants ranged in years of service on the work team and comfort level with the topic, I devised a plan to reflect, move, and shuffle. Each participant is given a notecard. Depending on the number of participants, and depending on the desired size of discussion groups, at least four different colors of notecards are distributed around the room. Participants are given three minutes to write (or brainstorm a list) about previous work (since the last meeting, the beginning of the year, or some other timeline). Three areas of the rooms are marked with a number (1, 2, or 3). When the writing time has expired, participants are directed to move to a number. Each number can be prescribed, or participants can be given the direction to separate themselves according to their own, individual, criteria. This is completed without talking. In their newly formed groups, participants share with a partner, or with their entire group, why they placed themselves in the group and highlights from their notecards. After 3-5 minutes, participants are told to reorganize themselves according to notecard color. The newly formed pairs or groups discuss their reflection, as well as any other insights. When prompted, the groups discuss further work that needs to be completed. After another 3-5 minutes, participants are directed to return to their seats and a priority list of future work is developed. This activity allows multiple voices to be heard. Movement activities help energize the reflection process and allow for purposeful processing time to be planned. Processing time is built in during silent writing, multiple times to share, and reflection time prior to devising a priority list. Although this activity was used during a professional development session, it could easily be adapted for a classroom. The activity could focus on prior learning, background knowledge, discussion questions, and so forth. Mixing up groups, guiding students to evaluate their learning based on their own criteria, and utilizing movement helps energize the classroom and build the foundation for deep discussions. The start of the school year is one of the most exciting times of the year for teachers, students, and parents. While some may argue that point, as a teacher I am filled with elation, nervous energy, and satisfaction in my chosen profession. The start of the school year is filled with preparation, and teacher after teacher will tell you how important it is to set-up the classroom in such a way, to greet students, to establish relationships, to build a positive learning climate, and to establish routines and rules. How individual teachers and classrooms go through this process varies. Utilizing movement in the classroom is essential, and starting the year off by frequently using movement helps teachers and students get acclimated to the process and helps establish a practice that becomes ingrained in the daily/weekly activity of the classroom procedures. When thinking about using movement in the classroom, teachers need to define the purpose behind using movement. If the purpose of adding movement is to add fun to the classroom or to do it because other classes are doing it, the success may dwindle. When teachers and students understand the benefits of movement, the benefits kick in and the needs of the whole child are addressed more adequately. One of the reasons I started to use movement in my classroom was to create opportunities of students to refocus on a task or topic at hand. Research has indicated the connection between the use of movement and improved focus or on-task behavior (Grieco, Jowers, & Bartholomew, 2009; Jensen, 1998; Maher et al., 2009). As I gave instructions on how to perform movement activities, I informed students of the benefits of focusing on the task at hand. Furthermore, I planned activities with the idea that I wanted students to focus on learning a specific task that was either addressed during the activity or immediately after the activity. If content was specifically challenging, I had students perform the activity prior to engaging in learning difficult content. Using movement to focus students became my purpose. Since it was my purpose, I was very intentional in its use, which improved the success and understanding regarding movement activities selected and used throughout the school year. Focusing on a clear purpose helps teachers with consistency. A clear purpose also helps communicate reasons for using it to students, other teachers, and administrators. Plus, it helps direct evidence towards meeting the needs of diverse learners. Once a purpose has been established (or contemplated), teachers can move into the initial routine process. Establishing a movement routine should to be addressed each time a new movement activity is introduced. However, the initial routine introduction is more elaborate. Intentionally practicing how to perform a movement activity takes time initially, but the payoff will save time in the future. Using movement multiple times per week keeps students engaged with the content and helps students and teachers expect and understand why it is being used. As movement activities are introduced, students may need to be reminded of the routines in place. Also, as the year progresses, teachers may wish to add novelty to a previous activity with simple modifications. The brain feeds off of novelty, and adding new elements to an activity increases student awareness aiding to effective classroom management. Adding movement also helps teachers determine when to involve kids. A lesson that seems to be teacher-directed can be shifted to more of a student-directed lesson with the addition of individual and collaborative movement activities. Being intentionally with movements helps teachers sustain its use in the classroom and support the routines they established at the beginning of the school year. This is true for content-specific movement activities and brain-break activities. If teachers are worried about classroom management, it is important to establish routines and start with short and simple activities. For example, having students stand by their desks and form a statue with their bodies representing something they have read is a simple movement. Students do not have to move away from their desks, and it can be done in seconds. The routine may include telling students to stand to the right of their desks and push their chairs in. on the count of three, freeze into a position. Hold the position for 10 seconds and then return to their seats. Another simple activity is to post key questions from a unit of study around the room. Students stand and move from question to question to complete their answers. The routine may include informing students to remain silent, walk to a sheet to read a question, make sure no more than three people are at the question, move to another question, and return to their seats when finished. These are simple activities that require small efforts from the teacher and the students. These are also activities that can be elaborated on easily as the year progresses. Using frequent movement activities in the classroom will transform the teaching experience for teachers and the learning experiences for students. This weekend I was sitting with my family at a restaurant as we were celebrating the Saturday basketball games. My daughter started tearing pieces off the children’s menu. As we started to reprimand her, she informed us she was creating a cootie catcher, also know as an origami fortune teller. I helped her fold the corners, and she eagerly wrote down the messages inside. 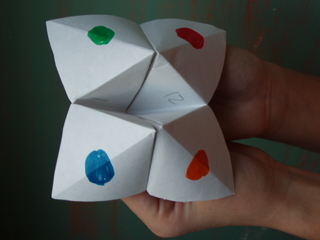 We then took turns giving playing with the cootie catcher to hear our fortunes or specified descriptions of ourselves. Through lots of laughter, my daughter felt a sense of pride, and we were entertained. Regardless of how it is used, movement can be applied to get students, and adults, talking to one another. During the workshop I attended last week, half of the attendees received a cootie catcher and the other half did not. Attendees were instructed to stand up and find someone with a cootie catcher. Pairs went through the motions and answered questions to help them get to know each other. We continued for a couple of minutes switching partners multiple times. Not only did attendees get to move, but the also were able to use a manipulative to engage. This can be used the same way in the classroom, or different categories and discussion questions can be printed on the cootie catcher to either review or spark larger inquiry. This can be used in any classroom, and once it has been introduced, students can be in charge of creating their own questions for future uses. When I talk to teachers in multiple disciplines, a common frustration is time and the need to race through the curriculum in order to meet the demands of the curriculum or the complexity of the standards. The fast paced world can create stress and general imbalance in the classroom for both students and teachers. In order to work through the blockage that can occur in an anxious and stressful environment, it is necessary to provide time for students to process as well as time for them to get up and move. I often suggest that teachers schedule processing time. This may feel like an add-on to an already overcrowded schedule, but the outcome can actually add time. Students that are able to process not only internalize the concepts be taught, they can begin to think beyond the constraints of a packed curriculum. Processing time also helps to lower stress avoiding students from shutting down possibly reducing the number of minutes needed to reteach or address behavioral concerns. To further reduce stress and activate the brain, students can be given the opportunity to process while moving. A simple way for students to do so is to have them get up and walk in the classroom. I was in a classroom a couple of weeks ago and the teacher mentioned how she set arrows up in the classroom for students to follow. Students can process and walk in the direction of the circles, or students can walk and process following a specific path. The goal is for them to think. Engaging them in movement while thinking helps as the connections in the brain begin to form. Once students return to their seats, they can continue to process verbally in pairs, small groups, and/or in a whole-class setting. Again, initially this process takes time, but the payoff is beneficial for all, teachers and students. CHINA, Maine —Instead of going for a bike ride after school, a few kids will take a spin in the middle of a classroom at China Middle School. During a test day in Josh Lambert’s seventh-grade math class, students were pushing pedals while pushing pencils. “It makes math class not so boring sometimes,” Hailey Mayo said. Keeping kids’ attention for almost an hour and a half when you are talking about math can be a challenge, Lambert said. “School is just a long time to sit and listen to adults tell them what to do,” he said. I just returned from Orlando. The sunny, warm weather was a contrast to the chilly, wet weather. Each time I travel to a conference, I feel exhausted when I return. I barely had a chance to recover from the AMLE Conference in Columbus, Ohio, before I headed to the KDP Convocation in Florida. Now, I am recovering from both trips. I’m not just physically exhausted, but mentally exhausted as well. I absolutely love the atmosphere of a conference. I equally love the learning that takes place, but with so many great ideas, practical teaching methods, and integral pieces of research, my mind starts to swirl like the Oz tornado. Of course, this is all good. It comes down to moving from a sunny, energetic, stimulating moment to a calmer, cloudier, sit-by-the-fire processing moment. Even though I am tired, I love both moments. In reflecting on the KDP Convocation, I was drawn to several topics. Alex Kajitani commented, “In order for students to be fully engaged, teachers need to be fully engaged.” This struck me because, too often, I hear teachers either blame the curriculum or blame the students reference class boredom. It is, however, passion that can create a stimulus for learning. It is at these times that it may be necessary, as Joel Laguna stated, to, “Let go, be bold, take risks.” Teaching is a rewarding career, but it teachers should not be tied to a curriculum. Teachers should have the freedom to illicit student inquiry, as well as their own inquiry regarding the subjects, and classes, they teach. This can require taking a risk. We, teachers, need to tear down walls and be willing to put ourselves out there. We may fail, but we have to give ourselves permission to fail. Dr. Pasi Sahlberg framed the difficult job of teaching as “Teaching is not rocket science, it is more complicated than that.” Reaching the needs of all students and setting unlimited expectations for all is foundational to our role as educators. Too often excuses get in the way. While many of these excuses can be legitimate, we have an important job to conduct. I think this is why I am advocating for using movement. I took a risk to challenge the status quo of what I had envisioned a productive classroom to look like. I was wrong. As I continue to grapple with and explore the adolescent mind, it is apparent that movement in the classroom is a critical component to helping students achieve maximum potential in my classroom. I presented to sessions at KDP: an edTalk (Moving to Manage), and a workshop (Moving the Reluctant Reader). Teaching is much more than just content. While it is scary to move thinking beyond standardized testing and content knowledge, it is necessary to keep the needs of the whole child at the forefront of our decision-making process.